The Event brought the Sea of Leaves into our world, an immense forest that choked cities and drowned civilisation overnight. From the trees came the Call, a lure to the weak that decimated the population. In the aftermath only pockets of humanity remain, resisting the woods' siren song. In the endless forests lurk the Lost - whose wills were drowned by the Call - and the Wild, who have forgotten they were ever human. 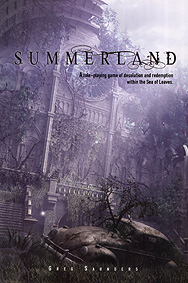 Some paper, pens friends and a handful of six-sided dice are required to play Summerland.